Yes, the mob hooligan who was on the FBI's America's Ten Most Wanted and who ordered a 1981 hit of a Southern Hills member turned out to be living a few blocks down the street from me here in the Home of the Homeless. Faldo: I Need More Time! 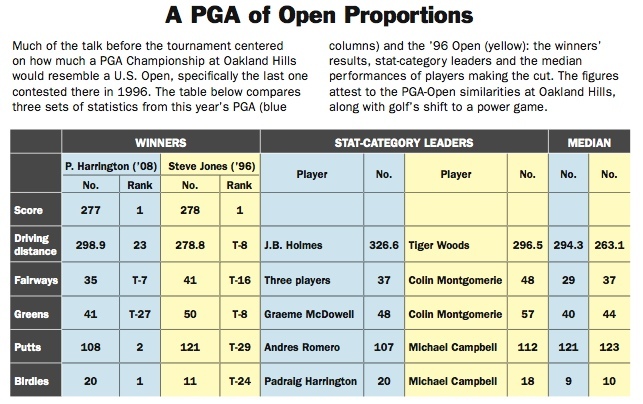 In the post PGA coverage, Brett Avery offers a rather astounding chart in the Golf World stat package (PDF). Now I'm in favor of the groove rule change because it has the potential to restore the importance of firm greens, but will only be meaningful if an increase in fairway width comes with it. However, the USGA and R&A continue to contend that armed with V-grooves, the world's best will be forced to respect rough and therefore they will have to throttle back in an attempt to hit more fairways. In other words, it's a backdoor way of rolling back distance increases. I still believe it's pure fantasy, but hey, if it makes them happy and leads to other positives, so be it. Yet no study has determined how much fairway narrowing has played a role in the driving accuracy decreases so regularly cited as the cause for regulating grooves. So here we have Oakland Hills, host to the 1996 U.S. Open and on the cusp of the distance explosion, and again host to the 2008 PGA where a remodel narrowed fairways and rough was farmed and coifed. The 2008 field median was 30 yards longer off the tee than in 1996 while the fairway's hit median dropped 8 fairways. The governing bodies would like us to believe that these dramatic increases in distance and decreases in accuracy are a result of players finding themselves armed with U-grooves that persuades them to flog drives with reckless disregard for the awful fairway contours crafted to take driver out of their bag. Seems in the case of Oakland Hills that the radically improved driver/ball combination (oh and of course, the increased athleticism!) along with a further reduction in width since 1996 was likely much more significant than the grooves in fostering such radical differences in distance and accuracy. "Tour pros can be crybabies from time to time when it comes to how they earn their living, but once in a while their tears are justified." "After missing and putting out, Garcia gave Harrington the quickest of handshakes, Woods/Mickelson style..."
"This redesign by Mr. Jones needs to be redesigned"
In considering how the setup impacted the PGA Championship, we get a couple of different perspectives. It's fascinating to see a change in media assessments of a tournament's entertainment value and the influence of a course setup. It wasn't long ago that a U.S. Open setup would have been widely praised for putting the flatbellies in their place and that players are spoiled brats. But after so many of these extra narrow, over-ripe setups driven by a desire to pump up scores, the review are pretty consistently negative. First, there was no Tiger Woods, a blow to any event when the best golfer on the planet can't play because of knee surgery. Then, the rains came and went, and came and went. For sure, it felt like monsoon season, not August in Michigan. For the most part, fans were more occupied trying to dodge rain drops than watching nifty shots. Those things, plus the weak economy in these parts, also kept the crowds down. No matter what attendance numbers were announced, it just didn't feel like a major. There was more buzz about the mayoral mess in Detroit than the play on the course. Harrington's thrilling victory on Sunday at Oakland Hills, the overnight rating for the PGA Championship was 3.0, down 55% from last year's final round at Southern Hills — an event won by (surely you recall) Woods. Mark Whicker was another member of the media who was glad it rained to save the setup. So the '08 PGA lived up to the texture of the ones that preceded it. But the trend of "Tiger-proofing" golf courses has turned into "birdie-proofing," without slowing Woods a bit. The drill is familiar. Length the courses and keep par at 70. The 18th hole, a 498-yard par-4 with a landing area that could barely accommodate a model airplane, played to a score of nearly 4.8. But the mania for artificial length hasn't made these tournaments better. Flesch, a thoughtful member of the PGA Tour's player advisory council, expressed more far-reaching concerns for a pricey leisure sport that during this economic downturn is seeing more courses close than open and the number of participants and rounds played continue to fall nationally. He didn't quite accuse this PGA Championship of killing golf, but he came close. "If we're worried about attracting people to come play, if they see how miserable we are out there, why would they go, 'I want to play that game!'?" Flesch told Golf.com's Cameron Morfit. "It's fun to watch guys make birdies. They smile. The PGA is committed to growing the game; is this how they want golf portrayed? "The thing that bums me out is I don't know how many of our top 15, 20 guys got chased out of here this weekend. Do you think that's the leaderboard the PGA of America wants up there when they're fighting the Olympics? How are ratings going to be this weekend? People are going to look at Charlie Wi, myself — I'm not saying anybody doesn't deserve to be up there, but people are going to turn around and go, 'Well I've never heard of any of these guys, let's see what's going on with the Olympics.' The PGA has got to be careful. They're getting what they're asking for, is what I'm saying." "He didn't give you much option in the way you can play the golf course." Then later Kostis said something like, "he's taken away a lot of angles Donald Ross intended." We won't have to see a major at Oakland Hills and it's excruciatingly awful 18th hole anytime soon! Anyway, so no U.S. Open anytime soon and the PGA is booked until 2016, except for an open date in 2014. However, I suspect that as long as the American auto industry remain$ in the dump$, the incentive to return is meager at best. It couldn't have helped that Verne Lundquist estimated the 15th hole gallery watching Ben Curtis to be about 150 in size! So let's read about "the Monster" one last time for the forseeable future, starting with lede's covering Sunday's win by Padraig Harrington. The Walk of Champions has a new face. It belongs to Padraig Harrington. Oakland Hills Country Club doesn't. The South Course is still the South Course. It's still a monster. Padraig Harrington isn't interested in sentimental story lines that keep popping up at the majors. He's too busy winning them, and writing his name into the history books. Padraig Harrington of Ireland made more history than even he realized at Oakland Hills Country Club on Sunday when he snatched the 90th P.G.A. Championship from Sergio García’s grasp and refused to let go. Three weeks after his successful title defense of the British Open at Royal Birkdale, he became the first European in the modern era to win the British Open and P.G.A. Championship in succession, and the first to win the P.G.A. since Tommy Armour in 1930. Padraig Harrington denied Sergio Garcia his first major yet again last night in scenes so remarkably reminiscent of last year's Open. Just as at Carnoustie the Irishman with the manic eyes broke the little Spaniard's heart and just as at Carnoustie the difference between the pair was so small, while the contrast of fortunes was so great. For unbridled ecstasy see Harrington, for Garcia see bitter agony. Lorne Rubenstein zeros in on the closing hole antics. There was something surreal about what happened to Harrington during the final round, and what he made happen. Clearly, tough questions about heart remain to be answered by a group hardly lacking in ability. "It's all about experience and getting into position to see what it feels like," said Faldo after watching the final-round retreat of his young compatriots at Augusta earlier this year. "But one bad shot at the wrong time can scare you. They are all young and they have to come back better prepared. Majors test every nerve ending in your body. "They have to get rid of that voice of doubt in their minds. You need the self-confidence and the bottle. And you have to hit the millions of balls you have to hit to think you deserve success. Whether this group actually has it or not remains to be seen. They certainly have talent. And they are getting into position. Now it is down to their determination to succeed." John Huggan considers the plight of England's finest, who really stunk it up this week. He made a mistake by not making sure he laid up into the fairway out of the bunker that he hit from the 18th tee. But he caught a decent lie in the high rough and said that was a good break. Garcia also thought so. “There's guys who get a little bit fortunate in majors,” Garcia said. “They manage to get things going their way. Unfortunately, it hasn't happened to me. AP's Larry Lage delivers notes on Phil Mickelson, Masters exemptions and explains what happened to J.B. Holmes on the first hole of the afternoon round. The winner's press conference is here, the other transcripts here. Q. Is there any one particular shot you would like to have back again, one particular shot? Q. Or is it more than one? SERGIO GARCIA: No, I felt like -- I felt like I gave it my best. Obviously what I'm not going to do is get on the 16th hole and try to hit it 40 yards left of the green. I mean, that's not the way I play. I tried to put a good, solid swing to the middle of the green and hopefully it goes there. If it drifts a little bit, perfect; came out of it just a touch, and just went in the water. But then I hit a great putt on 17. I don't know why it didn't break. It lipped out. And then 18's just a tough hole. But no, I felt like I responded well and he was obviously very good on the back nine and things just happened his way. Golfweek's summary of 18 notes includes some tough commentary on Sergio's post round press conference. Matthew Rudy declares winners (Padraig) and losers (Sergio, J.B., and U.S. Ryder Cup team) and is also pretty tough on Sergio in particular, also not buying his post round remarks about fate not going his way. Speaking of the Ryder Cup, here are the Americans who clinched spots, courtesy of PGA.com. Stop laughing Faldo. Mark Lamport Stokes talks to Mike Weir about this year's majors. "It seems like every year the majors are getting harder and harder," Weir told Reuters after carding a one-over-par 71 in Saturday's third round at the U.S. PGA Championship. "This year we have played in a lot of wind. Almost every week, even a normal week on the Tour, we have played in a lot of wind. "The Open championship had winds stronger than the others and then we've had it tough again this week as well," he added, initially referring to last month's British Open at Royal Birkdale. "I would definitely say this year is the toughest set of majors I've ever played." Doug Ferguson notes that it was a tough year and points out that Justin Leonard made all four cuts yet was never under par after any round. Jaime Diaz says that course setup criticism missed the mark because Kerry Haigh "got fooled by Mother Nature" and the early week "perfect storm" of sunny, dry weather. That sounds familiar...oh right, that was the USGA's excuse at Shinnecock. That pesky, sunny, breezy, dry weather does have a way of exposing courses already too close to the edge, doesn't it? On the tournament operations side of thing, Susan Whitall blogs at Detroit News about a lot of things, including the lousy food options Sunday. The PGA Golf Shop teemed with people milling about $6 ticket holders, $39.62 umbrellas, $70.75 jackets. They also snatched up $61.32 handheld periscopes, $7 shot glasses, $95.28 polyester vests with fake-fur necks, and $750 paintings of the 18th hole. So $750 for a painting of the 18th hole? That's expensive garage wall material. Greetings from Santa Monica where they will never host a PGA again (and where it was 76 with a nice sea breeze today, and going to be the same tomorrow and that's right, not a chance of a thunderstorm anytime soon). Here's the Golfweek summary of what little did happen during Saturday's washout. Sunday's forecast, Haigh said, includes a chance of isolated showers but not a major weather front like Saturday. As for the likelihood of finishing on schedule Sunday night and not Monday? "We're optimistic," Haigh said. He added that officials did not consider moving third-round tee times earlier even though afternoon storms had been predicted. Bill Fields explains how it's going to work Sunday. Barring any more delays. And if there's a playoff...oh let's not even say it. Several pin placements were more accessible than they had been all week, which explains the rash of red numbers Saturday. Camilo Villegas was four under for his first 14 holes, two over total. Fredrik Jacobson, Graeme McDowell and Prayad Marksaeng were three under for the day when play was suspended. Steve Elling details Romero's 40-spot jump heading into Sunday. That's 40 spots with several groups yet to tee off. Then again, they tee off with softer greens now, so maybe he'd like to start over as they would have in the old days? The scribblers had nothing better to do so they jabbed at Kerry Haigh about the decision to not move up tee times Saturday despite the dire weather forecast, and also asked questions about several course setup issues. Q. You mentioned adjustments that you made for today; Andres Romero shot 65. Could you enumerate exactly what the adjustments were? Was there extra watering on the greens? Did you top off the rough? What exactly did you do in preparation for round three? KERRY HAIGH: We mowed all of the roughs Wednesday, and the plan was to look at it, see how it was coping and growing. Considered cutting the rough again Friday, and we did, in fact, do so in the fairway landing areas last night. And we also put some water on the fairways, or some more -- a little more water than had done the previous night. And continued to syringe and put some water on the greens. Basically that was it. And put the pins in collecting bowls. Sounds like a lot to me! Jeff Babineau addressed the notion of the PGA making such adjustments and other topics in a series of entertaining thoughts filed because there wasn't much else to write about. Let’s see, on the same week the U.S. Golf Association dials back grooves, the PGA of America turns its usual cuddly PGA Championship into a House of Horrors at Oakland Hills, playing on greens as hard as airport runways and growing rough thicker than seaweed. Hey, Oakland Hills is a tough track, but nobody expected this Bogeyfest. The 12-handicapper watching at home could not break 110 at this place. So remind me, please, what game are we all trying to grow? Golf? Or bowling? And for all of the people who reject my contention that setups like this, with rough coiffed like Donald Trump's hair and fairways narrowed to ridiculous widths, are driven by frustrated golfers, we get confirmation from the Open Doctor himself in a John Paul Newport column. Be all this as it may, the major tournaments claim a more practical rationale for their murderous courses: to identify the best players. "You want a setup that is a total examination of their skills," Rees Jones told me by phone this week. Oakland Hills is very long and its par threes form one of the toughest sets in golf, he said, but the green complexes are the primary challenge. "From 30 feet, you may have a putt with a triple break," he said. Fans like watching tournaments on hard courses, he suggested, because they can't relate to the 24-under-par totals the pros sometimes shoot at regular PGA Tour stops. "They like to see some ebb and flow, not all birdies, because that's more like the way they play the game," he said. You know I was thinking the same thing watching the Olympic swimming tonight. I want to see a 400 meters where they have a wave-maker running to make things interesting. Maybe make the water 50 degrees and put spikes on the starting block so they can't get a good start. Now that's ebb and flow! Lorne Rubenstein brings up something I've been waiting to see if anyone would point out: Oakland Hills is just too narrow to function as a proper strategic design. Ross wanted the course to have width so that players could work their way into the fascinating greens by playing angles and to be able to use the slopes in and around them. Instead, the fairways are so narrow, and the rough so high, that the course tests only accuracy off the tee and the ability to hit high shots into the greens. The lack of width and the endless rough are far more insulting to Ross's design than the course's length. Finally, Steve Elling reports that David Feherty had another accident on his bike this week. Feherty, an analyst for CBS Sports, was waiting to conduct a post-round interview with Lefty, leaning on an aluminum cane that he had purchased after getting clipped by a car for the second time this summer while bicycling. Mickelson could not resist and deadpanned: "Have you considered finding another hobby?" "He drove the ball really long and really straight and he took a long time to do it." He drove the ball great, but he needs to pick the pace up," DiMarco said without prompting afterward. "He's really, really slow. Holmes has additionally begun having his caddie help line him up over putts, a habit that is all the rage on the LPGA. It doesn't trim any time off his personal shot clock, either. Earlier this year, Holmes was openly defiant about his glacial pace when in contention, saying that with $1 million on the line, he's not going to rush shots for anybody. Which isn't to suggest he isn't trying to improve, he said. Let's just say that, like one his driver shots, there's much acreage to be covered. "You get in pressure situations in tournaments like majors and it takes longer," Holmes said. "I don't want to be that slow, but you need to make sure your mind is right." Everyone has to play the same course. I heard it a few times on the Golf Channel post game show. But really, is that a satisfactory explanation of what's going on at Oakland Hills? Sure, the players have to say it because mentally, they have to deal with the course for two more rounds and most people view any kind of course criticism as a cause for celebration. I don't see some key questions being asked, perhaps because everyone is asking more Ryder Cup questions than anything else. Still, there is some scrutiny of the course setup that has led to some huge scores. There was change to the golf course, where the P.G.A. of America took some pity on the beleaguered professionals and shortened the four massive par-three holes by a total of 71 yards off the card, and lopped another 87 yards off the par-four sixth, shortening it to a drivable 300 yards. There were even some changes in attitude among the golfers, who were beaten to a pulp Thursday by a par-70 golf course that played to an average of 74.85 strokes, second highest of the year in relation to par, behind only Royal Birkdale’s 75.87 in the British Open. But the more things change, well, you know the rest. Despite the yardage concessions, the field stroke average was exactly the same as the first round, and the 74.85 ranked as the most difficult for any second round this year. Robert Allenby has been perhaps most vehement in his condemnation of what many have construed as a dirty-tricks campaign by the tournament organisers. The Australian, a man not noted for his reticence, was scathing in his assessment of the course following his first round of 76. At the end of the day it's what's fair and what's not fair," said the world's 29th best player. "The set-up here is lousy. It's not enjoyable to play. They have taken an OK golf course and turned it into a lot of crap. That's my opinion and I'm sticking to it. Many other players have voiced concerns over the direction in which the authorities appear to be taking the game. "It's a strange year when the US Open, traditionally the toughest of the majors, is the most fun of the four," said the former US Open champion Geoff Ogilvy, neatly summing up the feelings of the majority. "None of this makes any sense at all. I mean, the PGA of America spend millions of dollars on advertisements, then they go and make the game look ridiculous. The whole thing is nothing but a struggle for all concerned." John Hopkins blasts the PGA of America over the rough maintenance practices and overall setup. Why is this necessary? It is not as if a 7,395-yard golf course with a par of 70 and 135 bunkers and slopey greens that run at 12 on a Stimpmeter is not difficult enough already. What a shame. They have completely taken any imagination out of the equation. A player goes into the rough and thinks: I've got to get out of here, I don't care how." With that he picks out his wedge, takes a backbreaking heave at the ball and hopes it moves 100 yards out on to the fairway. Alan Bastable talks to Winged Foot super Matt Burrows about the practice of brushing the rough because Steve Cook at Oakland Hills "wasn't available for comment." The Davids' friend, Bruce Abbott of Bloomfield Hills, is volunteering as a marshal for the tournament. "I think the hole I'm at -- 16 -- is the most difficult, it's the course's signature hole." Abbott recalled watching how precisely officials monitor landscaping. "This week, the PGA had a guy clipping the last blades of grass near the pond on 16," he said. The trimming was done, he said, so balls landing on the pond's edge wouldn't be impeded from going into the water. "They were toughening the course," said Abbott. Abbott said greenskeepers also take a blower to the rough. "They fluff it up and comb it away from the hole," he said. Steve Elling quotes J.D. Holmes, Ian Poulter and the PGA of America's Joe Steranka. But Holmes bashed away at the podium, too. By day's end, the second-round scoring average of 74.845 was the highest all year on tour relative to par. "I think there should be some tough holes, but I don't think it should be, 'I hit a perfect shot and made double-bogey,'" said Holmes, a two-time PGA Tour winner. "You've got long rough on every hole, is the frustrating part. When it's completely unfair on some holes, no, a major shouldn't be like that." "You are just trying not to bleed to death out there," said Ian Poulter, who finished second at the British Open three weeks ago. "It's like the PGA has sliced your throat on the first tee and you have to try and make it 'round to the 18th without dying. "It is pretty frustrating when you stand on a par-3 with a 5-iron and are aiming for a bunker because you know that's the only way you can make par. That's pretty sad. I am very disappointed we are having to do that on such a great golf course." And now for the official response. "We set it up the same way," Steranka said. "The difference is, Oakland Hills is hard. It's one of the most recent classic courses that's been set up for today's modern player, and not just today's equipment." This begs one key question: if Southern Hills was so successful with rough at 2 3/4 inches, why not replicate that at Oakland HIlls? As for round two, Golfweek's all-you-need-to-know 18-point recap starts up with some enjoyable Monty moments following his 84. "Make that your last laugh, OK?" he snapped at an American reporter before agreeing to sift through the wreckage of his five-hour mauling at the hands of the Monster that is Oakland Hills. Monty, who finished tied for 149th at 20-over-par, said he did not realize the significance of the putt on 18. "I wasn't conscious of that score," he said. "I wasn't conscious of much, to be honest. That was the most difficult day I've had since my poor score at Muirfield in 2002. But today was as severe as any course I have ever played. Nothing like the course we [the European Ryder Cup team] did so well on four years ago." John Hopkins paints an entirely different picture of Monty's post round appearance. The words courage and dignity are used! Here's his courageous and dignified press conference transcript. No. 2, par 5, 529 yards: Holmes vaporized his tee shot, leaving him an easy wedge to the green. He two-putted from 12 feet for a birdie. o. 6, par 4, 300 yards: After the PGA moved up the tees to tempt players, Holmes took the bait and drove the green. He two-putted from 30 feet for a birdie. No. 12, par 5, 593 yards: After crushing his drive, Holmes reached the green in two with, get this, an 8-iron from 217 yards. That's right, 217 yards. No. 14, par 4, 488 yards: As it turned out, the rest was mere prelude. Holmes swatted his drive 401 yards and had 87 steps remaining. He flipped a wedge onto the green to record his third birdie in a row. One of the bogeys belonged to Mark Calcavecchia, who missed his tee shot to the right. That's not what caused the bogey, however. "I stepped on my (expletive) ball," Calcavecchia said. "That's all you need to know about the sixth hole." It was tough to watch round one of the PGA because. I was quite emotional. The measly crowds and Tiger-free atmosphere kept reminding me of the 1995 PGA at Riviera. I'm sorry, but these old memories are deeply embedded and it just happens. The PGA Championship looked a lot like the U.S. Open, with only six players able to break par Thursday among the early starters who got the best of the weather at Oakland Hills. It sounded like a U.S. Open, too. Goydos, who’s sarcastically nicknamed “Sunshine” because of his disposition, is one of the best quotes on Tour. So what did he think of Rees Jones’ redesign of Oakland Hills. “If you had Rees Jones redo ‘Scrabble,’ he’d leave out the vowels,” Goydos said. Here's the AP story on Kenny Perry's WD which the above Golfweek recap noted, "remember, his focus this year was never on the majors." Steve Elling says it's fitting that Jeev Singh should contend and win since it's the year of the injury because Singh is barely getting around thanks to a nasty ankle injury. Bob Wojnowski on Robert Karlsson's amazing story, not to mention his excellent year in the majors so far. Bob Harig also profiles the first round leader. Lorne Rubenstein on Phil Mickelson's 70. Mickelson then digressed into a brief discussion of high pins and low pins. Very few golfers use such terminology. Mickelson said the course surprised him by being much firmer and faster than it was during practice rounds, but that it still offered some birdie chances. He referred to these birdie chances as being on greens where the holes were cut in low spots. The comment requires some deconstructing, which is part of the fun of trying to understand the way Mickelson sees golf. His doors of perception are open, wide open. By low pins, Mickelson meant that some holes were cut in catchment areas, so that he could feed a ball in their direction. Mickelson, a shot maker and a thinker, likes to feed shots. But is he prone to thinking too much? It's working and so is the rest of O'Hair's body after a car wreck just before the U.S. Open, from which he withdrew before starting. He wound up playing one round of golf in June while tending to sore ribs. Driving on slick roads near his home outside Philadelphia, O'Hair skidded into a power pole, totaling a shiny new Mustang he had owned for all of three days. "I wasn't going that fast," said O'Hair. "The pole just kind of jumped out there in front of me. Plus, it was a stick shift, and I'd never driven one before." O'Hair sold the vehicle, or what was left of it. From yesterday, Larry Dorman profiles Adam Scott's rough ride this year that's included odd health issues and a breakup with his longtime girlfriend. Jeff Neuman writes about the PGA as golf's "littlest major," which it definitely looked like Thursday, if nothing else based on gallery size. The perversely-minded among us may one day notice a few similarities between Colin Montgomerie and Jimmy Hoffa. Both carried the odd surplus pound, both had reputation problems and both could call themselves legendary teamsters. Paul Mahoney also looks at Monty's plight and Sergio's surge. Monty's mood hadn't mellowed by the time he signed his card. He stopped to talk to reporters for exactly 26 seconds. "Too long, too tough," he huffed of Oakland Hills. "You can spray it 20 yards wide and you're okay, but if you spin off by six inches or one foot, you're not. It's a shame." And finally, Brian Hewitt reports that John Daly has a new instructor: Rick Smith. Talk about the coaching merry-go-round and six degrees of separation all wrapped into one. Smith is the guy who did a lot of good work with Phil Mickelson before Mickelson left him for Butch Harmon. Harmon is the guy who did a lot of good work with Tiger Woods and dumped Daly earlier this year because of what he perceived to be Long John’s errant off-course behavior. Now Daly and Smith are together and the squared circle is unbroken. Sort of. Daly said he and Smith worked for seven hours last Sunday at nearby Oakland University. He said his injured ribs are feeling better and Smith has convinced him to use his right side more now. “It’s all about the right side,” Daly said. “I love the guy. Plus he’s a feel coach and I’m a feel player." "[The rough] is five inches long. Why brush it back at us?" Paul Mahoney reports on Lee Westwood's scathing post round criticism of the Oakland Hills course setup. On site sources say the rough had been trimmed but it also seems the raking we spotted last week was taken to a new extreme. At least according to Westwood. "The course is 7,500 yards long, the greens are firm, and the pins are tucked away," Westwood said of Oakland Hills (official yardage: 7,395). "They are sucking the fun out of the major championships when you set it up like that. The fairways are narrow, and unfortunately if you miss the semi [rough] by a foot you are worse off than if you miss by 20 yards. I asked my partners [Geoff Ogilvy and Zach Johnson] if I was out of order, and they said 'No, if you are slightly off-line, you are crucified.' It is too thick around the greens as well. It takes the skill away from chipping." Comparing Thursday's conditions to the practice rounds, Westwood wondered if the PGA had dispatched an army of workers overnight to "brush back" the rough, changing its direction so that the blades point toward the tees, instead of toward the greens. "I can't think of a reason why they would do it other than to irritate the players," said Westwood, whose round included five bogeys, one double-bogey, and no birdies. "[The rough] is five inches long. Why brush it back at us? It makes no sense. People want to see birdies, and they have not seen me make any. I can't see anything wrong with being 9- or 10-under-par for the week." Westwood said that the PGA should have followed the USGA's lead at Torrey Pines, which was not the punishing setup often seen in the U.S. Open. "You have to reward the accurate players like they did at the U.S. Open," he said. "[That] was set up perfectly. It rewards accuracy and penalizes you if you are off-line. I didn't see that today." In John Hopkins' report, he implies the rough ploy was a mowing in only the direction toward the tee, as Augusta National does with its fairways so that its members who also happen to be on the Executive Committee don't have to do anything about distance!. While mowing fairways back towards the tees to bring balls to a halt sooner has been fashionable since it first appeared at Augusta a few years ago, the practice of doing the same to the rough is surely unnecessary. If the preview stories are any indication what's in store for this PGA, then we're going to be watching a lot of the Olympics. The scribes seem bored or maybe just distracted by the loud AC's in the Oakland Hills press center. Of course, I also paid no attention to Ryder Cup related stories, which there was no shortage of. Anyway, there's the usual theme of the golf course and how it's going to be the hardest ever, etc... Bob Harig addresses that tired theme. We often hear how brutal a golf course is on the eve of a major championship, then see weather conditions change or the expected difficulty turn out not to be as much as first touted. And there has not been a winning score over par at the PGA Championship since 1976, when Dave Stockton won at Congressional Country Club. But during a stretch in which major championships have been more tough than not -- four majors in the past two years have been won with over-par winning totals -- there have been an array of comments about Oakland Hills, none suggesting this is going to be an easy week. "I played Augusta this year for the first time and Torrey Pines, and those don't even come close to how hard Oakland Hills will play," said Daniel Chopra, who played Oakland Hills last year in a British Open qualifier. "It's a great golf course, but it's probably the toughest PGA I've ever played," Garcia said. Predicting a score is pointless because no one knows how the PGA of America will set it up when scores start counting Thursday. But wherever they put the tees and pins, Oakland Hills has gotten the players’ attention. John Huggan on the course and the chances of a European winning. "This course is set up like a US Open of three or four years ago, where missing the fairway by a couple of yards is the same as missing it by 10 yards," asserted Harrington. "So this is a tough and intimidating test, very penal. And if you miss a green in the wrong place it's a struggle to chip it closer than 25 to 30 feet. The constant debate is whether to play aggressively or cautiously." Geoff Ogilvy thinks this may well be the first time that the U.S. Open will have been the easiest of the four majors. “Augusta and Birkdale were impossible,” he said. Oakland Hills won’t be impossible, but it won’t be easy either. “It’s a beast,” said Paul Goydos. "Hardest course I've ever seen," he said Wednesday. "The rough has neutralized everybody. There's no shot-making out of that rough. I've never seen greens like this. It's tough." Q. Can anything other than a win be regarded as a success for you? Brian Hewitt reports exclusively that Kenny Perry scratched his cornea taking out his contacts Wednesday and his play will be impacted by the injury. In the picks department (I know, too late for your pool...), ESPN.com has some thing called a FOREcaster that lets fantasy geeks hit a bit red button and answer questions. The geeks like Geoff Ogilvy to win. Jason Sobel at ESPN.com ranks his top 25. Daniel Wexler chimes in with his breakdown of the favorites. If you want your cornea to feel like Kenny Perry's, just try to read Joe Steranka's longwinded "interview" opening comments today. The scribes managed to get three questions in. Steve Elling reports that the seemingly comical sight of a cop strangling Jim Weathers with a baton wasn't so funny after all as Weathers faces surgery. Timing isn't always everything, but I'm thinking the USGA announcement on grooves the week of the PGA Championship isn't all that different from Scott Boras revealing A-Rod's contract intentions the week of the World Series. I mean, sometimes respect needs to wait a week. Bill Fields reports on the awarding announced by Joe Steranka Wednesday, which is interesting only because the PGA of America is locking up a venue eight (!?) years in advance with the 2014 date still open (somehow I don't think that one's coming back to Riviera!). Perhaps they were locking up the New York area market in case the USGA was thinking about returning there in 2016, even though they are widely believed to be headed back to Oakmont that year. The Fields post includes lists of all future major venues. Larry Aylward asks me about Oakland Hills, the groove rule change and a possible winner. What will Phil do next to his bag? One can worry himself nauseous trying to guess the configuration. After all, Lefty has played majors with five wedges, two drivers, no driver and a driver that kept going left. Can a junior set be far off? On that front, Steve Elling files an interesting piece with insights from other players on Phil's club tinkering, with plenty of assuredness from Dave Pelz about the Team Mickelson thought process. "He wouldn't be Phil Mickelson if he didn't change clubs and try new theories," said Geoff Ogilvy, a fellow member of the world top 10. Welcome to golf's version of saying, "That's Manny being Manny." Bob Harig says Kenny Perry is using criticism of his red-blooded American ways to uh, well, show up at Oakland Hills this week in his final preparations for the Fall Finish. Randall Mell (here) and Craig Dolch (here) also ponder Perry's place in the game. John Huggan reports that Luke Donald's wrist isn't any better and that he's contemplating surgery. Phil Mickelson finished 18th, shooting 6-over-par on a course he had played since he was a junior golfer. During the Bridgestone Invitational last week in Akron, Ohio, Mickelson was asked about Jones' work. "Not a big fan," he answered. Asked what he would do if he were Jones, he answered, "I would try to not be so monotonous." Ohhhh, I think Rees will be hunting a certain Lefty down! Doug Ferguson offers notes on Tiger telling ESPN radio that he won't be back for at least 5 months (and he's not watching much golf, which makes two of us, only I can get to the bathroom without it being a chore). And Ferguson shares this on the Olympic golf movement, where Phil seems to be reading off a script. "Having golf an Olympic sport is exponentially more important to the game of golf than the majors," Mickelson said Tuesday from the site of the season's final major, the PGA Championship at Oakland Hills. "The reason for that is it would bring in 168 different countries and their Olympic foundation and all those revenues and that would be going towards the growth of the game." Hunter Mahan (sadly) apologized for his comments about how players perceive the Ryder Cup (too many cash cow parties for the PGA of America!). Seems he was called into the principal's office. Ratings for Firestone and the Women's British were microscopic, and sponsors on every tour are pulling back in these lean economic times. Most ominously, neither Van Sickle nor Shipnuck traveled to the British Open. Don't worry, 72-holes of stroke play in 2016 at some stalwart like Medinah will change it all, Alan. Okay, to the important stuff. Your pool picks. Golfweek's staff issues their selections, this time actually more than 24 hours prior to the start of play. Ed Sherman weighs in here. PGA.com's staff offers sleeper picks while PGATour.com's Fantasy Insider shares his thoughts on who might win. And finally, Tod Leonard chimes in with his likely contenders. In announcing Tuesday's U-groove ban, the USGA and R&A accomplished something truly spectacular, unprecedented and frankly, impossible: they had people feeling sorry for the PGA of America. I'll get to the good stuff about this rule change in another post, because for fans of strategic course architecture there could be some very exciting developments from this news. But momentarily, let's sit back and ponder at the utter lack of respect our fine governing bodies have shown their friends from Palm Beach, who have one week a year to shine and who have suppported the decision to ban U-grooves starting in 2010. After dragging their feet so long, with R&A lollygaggery largely responsible for missing the initial announced timeline, how could anyone in these organizations say, oh, we must announce this on Tuesday of the PGA Championship? Let's forget the disrespect shown to the PGA of America and consider this strictly from a practical perspective: you want to announce one of the biggest changes in the history of the rules at a time when people can digest the ramifications and give it full attention. With dwindling space devoted to golf in major media outlets, who in their right mind would want to compete with the year's final major? Oh that's right, the R&A and USGA. Brilliant. How do you feel about the timing of the joint USGA/R&A announcement on grooves?